Chromebooks have emerged as popular computing devices due to their affordable price, long battery life and ultra-portability. Competing with Chromebooks are cheaper Windows laptops, available in the same price range. 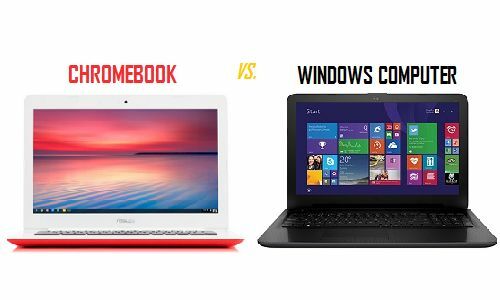 Hence, the need for a Chromebook Vs Windows Laptop Comparison, to help you decide between the two. Let us get started with Chromebook vs Windows laptop comparison from the point of view of an average user, most likely to use a computer for general web browsing, playing games, watching videos and getting some work done. As you must have noticed most Chromebooks like the Samsung Chromebook and those from Acer, ASUS, HP and others, are all light weight and ultra-portable. Chromebooks are basically designed to connect to Google Drive where all the processing and storage takes place. Hence, it is really easy to make Chromebooks light weight and portable. Cheaper Windows based laptops are also light weight and match the portability of Chromebooks. You can now get Windows Laptops by Asus, Acer and HP weighing more or less the same as an 11.6″ Samsung Chromebook. However, the weight of a Windows laptop starts to go up when you start looking for a traditional Windows laptop with enough local storage for your files and more power to play games and run professional software programs. Winner: Chromebooks, for ushering in a new generation of light weight cloud based computers. Both Windows 10 and Chrome OS have a user friendly interface. There is nothing really much to choose between the two, for most users it will just be a matter of getting used to the interface. Winner: This is a tie, no winners here. Chromebooks support Google’s Chrome browser which is a good browser and more than enough for average web browsing needs. However, you need to be aware that with Chromebooks you are limited to Google’s Chrome browser. You won’t be able to download other browsers to your computer. In comparison, Windows based computers allow you to download and install almost any browser that you want to. You can go with the default Internet Explorer, Firefox, Safari or even Google’s Chrome browser. Winner: Clearly Windows Computers for offering the flexibility and choice of browsers. Unlike traditional computers, Chromebooks offer limited space for local storage. Most Chromebooks come with 16 to 32 GB of SSD storage. The basic idea with Chromebooks is to store everything on the Cloud. Google offers 100 GB of Free Cloud storage for 2 years to buyers of Chromebook of any brand. You can also buy up to 1TB of space on Google Drive for $9.99 per month, in case 100 GB is not enough for you. In comparison, traditional computers come with 250 to 500 GB of local storage. You can download and store any file on your local hard drive and the familiar Windows folder structure makes it easy to access and manage your files. Winner: Windows Computers. For being flexible, offering both Cloud and local storage options. In addition to local storage, you can also make use of 32 GB Cloud storage that Microsoft offers for free. The good thing about Chromebooks is that you do not have to worry about buying basic productivity and antivirus software programs. Google takes care of securing and protecting your Chromebook and offers Microsoft Office like software programs for free. This means you can start browsing the internet and working on text documents and spreadsheets right away, without spending a single penny! With a Windows computer, you will be spending money to buy, upgrade and renew Microsoft Office and Antivirus software programs. Winner: Chromebooks for being virtually maintenance free. Windows computers are what most users are thinking of when it comes to getting things done. Microsoft’s Office suite includes popular programs like Word, Excel and PowerPoint which most users have grown up with. There is really no doubt that these programs help you get your work done with ease and unmatched efficiency. In the case of Chromebooks you will be using Google Docs and Google Sheets which can also get your work done. However, these applications are not yet comparable to Microsoft Office. Using Chromebooks you can also access Word, Excel and PowerPoint files using apps. However, this option works best when you are online; once you download these files to your local drive the Chrome OS will open these files as Google drive files. Although you may be considering a computer for general use, it is not uncommon to think in terms of whether or not you will be able to make use of this computer for work or business related tasks. In the case of Chromebooks, the answer clearly is a ‘No’ in case you are thinking of running professional software programs like AutoCAD, Primavera, Timberline, or accounting software. These professional software programmes are designed for Windows based computers and do not work on Chromebooks. Chromebooks cannot be connected to a printer, you will be relaying on Google’s Cloud Print technology to print your files and documents from a Chromebook. Windows computers can be directly connected to printers and scanners. You will be able to print directly from your computer to a connected printer, without your documents going via the Cloud. Winner: Windows Computers for offering the flexibility to print directly to a connected computer and also via the internet (in case you want to). You can do decent photo editing on Chromebooks using programs like Pixlr, online version of Photoshop Express Editor and others. However, you won’t be able to use Adobe Photoshop, the most popular and professional photo editing software. Google and Adobe have partnered on making an online version of Photoshop available for Chromebooks. Until that happens, you will be going to a Windows computer for all your professional Photo Editing needs. Winner: Not declaring a winner in this category, since regular computer users will be happy with programs like Pixlr and Photoshop Express (online). On Chromebooks you can edit videos using apps like Magisto and WeVideo. These apps allow basic image editing capabilities like cutting clips, editing color, sound settings, adding text, adding music or voiceover, and transitions. This should be good enough for most users. However, these programs cannot match video editing software programs like Adobe Premiere, Sony Vegas or Final Cut. Winner: For the purpose of this comparison, we are declaring no winners in this category, considering that an average computer user is not likely to be bothered with the lack of professional photo and video editing features on Chromebooks. Those who are seriously into photo and video editing clearly need to go for a Windows based computer. With Chromebooks you do not have to install any security or antivirus software. Google takes care of protecting your Chromebook from viruses and other online threats, and promotes this as a selling feature of Chromebooks. Chromebooks automatically check for and apply security updates as soon as they are available, ensuring that you are always protected from the latest online threats and viruses. Mircrosoft too provides its online protection software ‘Microsoft Security Essentials’ for free and updates it regularly. Most users prefer to go for additional protection by installing Antivirus software programs from Norton, McAfee and others. While Windows computers have secured more wins in above comparison, you need to be aware that you will be paying a significantly higher price in case you are looking for a Windows computer with enough storage and power to run all your programs and games. Cheaper Windows computers that are competing with Chromebooks in terms of price point also won’t be able to offer the functionality of a fully fledged Windows computer that you might be looking for.